THOUSANDS OF FUNDAMENTALIST Christians across the US are readying themselves for the world to end tomorrow, after a fringe Biblical scholar made the prediction several years ago. 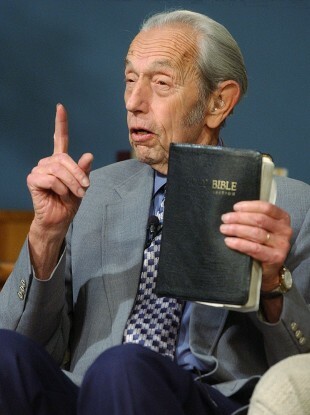 Followers of California radio figure Harold Camping, 89, have spent thousands of dollars putting up 2,200 billboards in cities nationwide to warn others that “the Rapture” is coming on Saturday May 21, 2011. Many have spent the last week saying a final goodbye to friends and extended family. According to Mr Camping’s calculations, tomorrow is exactly the 7,000th anniversary of Noah’s flood and God is angry again – this time about things like homosexuality, the New York Times reports. He warns that huge earthquakes will strike tomorrow as the saved are lifted up to heaven. Everyone else – meaning around 97 per cent of the population, according to the Globe and Mail – will get another five months of life before being consigned to eternal damnation on October 21. Camping, who is the leader of Family Radio Worldwide in Oakland, California, and is not affiliated with any mainstream churches, had previously predicted that the world would end in 1994 but now says he’d got his calculations wrong. According to the Daily Telegraph, he plans to spend the day watching the events on television. Email “Are you ready for the end of the world? It's tomorrow, according to this man”. Feedback on “Are you ready for the end of the world? It's tomorrow, according to this man”.